This chapter produces distinctions in the form of a topography of musical absorption that give a conceptual grasp of the various kind of experiences described in the last chapter. The DSQ members differ in their perception of how to focus (or not focus) while playing, how to practice, and the significance of immersion and concentration to the overall effort. In other words, they have little consensus on even some of the most rudimentary aspects of music and musicianship. The following analysis, however, reveals certain general patterns in the musical mind. I represent these in the topography, which consists of the following categories: standard absorption, mind wandering not-being-there, frustrated playing, absorbed not-being-there, and ex-static absorption. 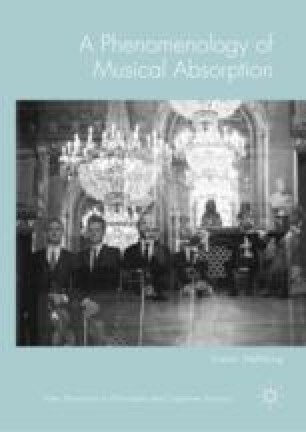 An earlier version of the topography of musical absorption is published in Høffding (2014).